With the near completion of the iconic Oman Convention and Exhibition Centre, Madinat Al Irfan is gearing up the next phase of development. Madinat Al Irfan, Oman’s largest urban development project, is poised for the next phase of growth as the finishing touches are being put to the stately edifices that host its anchor development Oman Convention and Exhibition Centre (OCEC). Spread over a 7.4-million-sq-m site in the Muscat urban corridor near Muscat International Airport, the massive development is being spearheaded by Oman Tourism Development Company (Omran), the Government of Oman’s tourism development and investment arm. Omran last year entered into a partnership with the UAE’s Majid Al Futtaim for the RO5-billion ($13 billion) Madinat Al Irfan, Muscat’s new ‘City for the Future’. An official foundation ceremony for the project was held late last year by the partners, who have also set up the joint-venture Madinat Al Irfan Development Company to oversee the development and delivery of the new city. As the master developer of 4.9-million-sq-m core of Madinat Al Irfan, Majid Al Futtaim is currently crafting the first phase of the masterplan which includes serviced plots available for commercial, residential, educational, healthcare, leisure and hospitality developments. 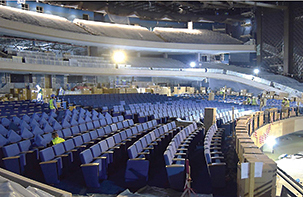 The main convention hall of the convention centre will have 3,200 seats. Phase One of the city, covering 250,000 sq m, will be developed over the next five years and will include public amenities. When complete, this phase will be a vibrant mixed-use community that will serve as the new urban centre for Muscat. OCEC, meanwhile, is located in Madinat Al Irfan East and is now seeing the completion of its key component, the convention centre, which is being built under Package Three of the project. 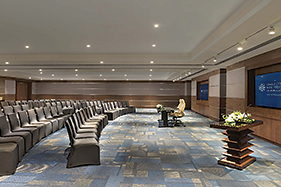 Leading Indian contracting firm Shapoorji Palonji is carrying out this package, which comprises the main convention hall (3,200-seat theatre One), secondary auditorium (450-seat theatre Two), 1,350-capacity main ballroom, 560-seat Junior Ballroom, 500-seat food-court, 28 meeting rooms, and administration offices. Work also includes MEP (mechanical, electrical and plumbing) installations, finishing and fit-out of the structural shell. The total gross floor area is 55,000 sq m.
Speaking to Gulf Construction, a spokesman for Omran says a number of facilities within the convention centre have been functional since November 2017. “Meeting rooms 8-14 have been opened and are functional since November 2017. 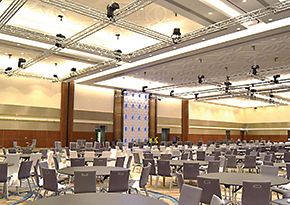 The 560-seat Junior Ballroom and the 450-seat theatre were opened in February 2018 while the Grand Ballroom and ‘Atrium’ event area are open and have been in operation since May 2018. The connection link through to the P2 exhibition concourse was completed last August,” he says. “We are now poised to launch the atrium meeting room suite (15-20) and food outlets,” he adds. There will be 28 meeting rooms and administration offices at the convention centre. The remaining six meeting rooms, the 3,200-seat main theatre, the main rotunda reception area, the VIP arrival pavilion and all external works are scheduled for completion next month (March), according to the spokesman. The world-class lyric-style main theatre named Rose Theatre will offer a unique platform across the region for cultural events, theatrical performances and conferences. OCEC, a state-of-the-art precinct owned and developed by Omran, aims to strengthen Oman’s position as a leading meeting, incentives, conferences and events (Mice) destination in the region. The centre marked its second anniversary late last year commemorating the successful operations of its 22,000-sq-m exhibition halls. The centre has demonstrated its potential to attract major local and international conventions, recording 291 events in its two years of operations, marking a significant 65 per cent growth rate compared to the first year. Madinat Irfan East covers the OCEC, in addition to four hotels and commercial business areas. Omran officially opened Crowne Plaza Hotel in November 2017 and is due to open the JW Marriott Hotel shortly, whilst also planning to open an Ibis Styles hotel in the next two years. All hotels together add 880 keys to the destination and local tourism market. The 300-key, five-star JW Marriott brand located adjacent to the eastern boundary of the convention centre and built under Package Four of the project is now awaiting its official opening. It includes east and west wings, a central ‘drum’, wellness wing, and a car-park zone. The hotel comprises a distinctive building with an architectural character that both takes advantage of and harmonises with the surrounding buildings and the local environment. Meanwhile, work has also been completed on the Oman Telecommunications Company (Omantel) headquarters complex in the business park of OCEC. The project, which is set to open shortly, houses two office towers sporting distinctive geometrical forms above a podium with three levels of semi-basement car-parking for more than 1,200 vehicles set into a sloping site. The main office tower, the Moon, has a circular plan form with a 30-m-diameter central atrium rising from basement Level B1 to Level 6, with a glazed skylight enclosure. This building comprises ground-plus-five office floors with a mechanical plantroom and a roof garden on Level 6. The second office tower, the Crescent – true to its name – has a crescent-shaped plan and comprises ground plus seven floors of office space. The two towers are connected by bridges at Levels 2 to 6. The building is clad in a woven stainless steel mesh which incorporates complex contoured and inclined faceted planes.